Breathe easy while we take care of your air. Sears Air Duct Cleaning can improve your home’s air quality and make your heating and cooling system more efficient, by cleaning your home’s air ducts. The dust, pollen, dander, sawdust, mold spores and other lightweight particles that float in your home’s air eventually circulate through your heating and cooling system. Your furnace filter traps some of this airborne debris—if you replace your filter when it’s dirty—but some settles in the ductwork. That accumulated dirt is available to move back into the airflow and blow into your rooms. Your furniture and floors get dusty sooner, but worse, your home’s air quality can deteriorate. If you have respiratory problems, you might find it more difficult to breath. If you suffer from seasonal allergies, you can be exposed to pollen all year long. 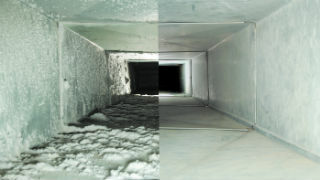 Dirty ducts also make your heating and cooling system less efficient. The filter clogs faster, so the system has to work harder to move air—and you can end up with a higher energy bills. 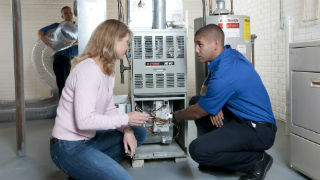 Also, particles of dirt wear on the components in your HVAC system, which can shorten its life. 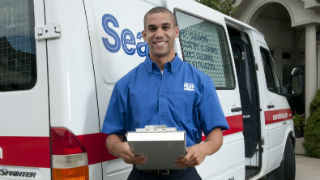 Sears Air Duct Cleaning follows the duct-cleaning guidelines established by the National Air Duct Cleaners Association (NADCA) guidelines. The technician covers the floor and install corner gardens to prevent damage to your home, attaches a powerful vacuum to the main duct, and then uses specialized tools to knock the dust loose so the vacuum can collect it. Before leaving, the air-duct cleaning technician answers any questions you might have and makes sure you’re satisfied with the work.